Here at ModuTile, our mission is to help our customers achieve their vision for flooring wants and needs. Our outdoor basketball courts are constructed from high-impact polypropylene based perforated tiles, proudly manufactured in the USA. Each of these one square foot tiles have a unique interlocking system, which makes the backyard basketball court floor a simple DIY installation project. 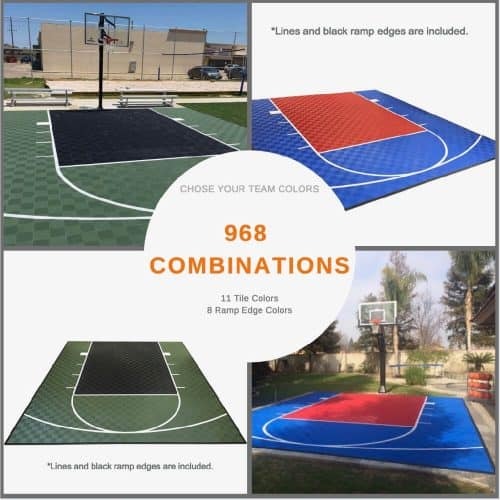 Below are four half-court outdoor basketball floor kits offered in the most commonly requested sizes, ranging from 20×24–ft. to 46×30–ft. All four packages include our perforated interlocking sport tiles with white custom painted high-school standard court lines and ramp edges for the surrounding perimeter. 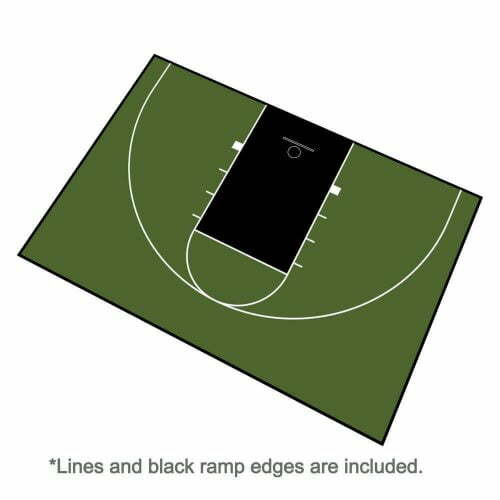 If you’re looking to customize your court dimensions, lines, tile colors, or boundaries, we are happy to speak with you directly to better understand what you’re looking for and to help accomplish your exact vision. 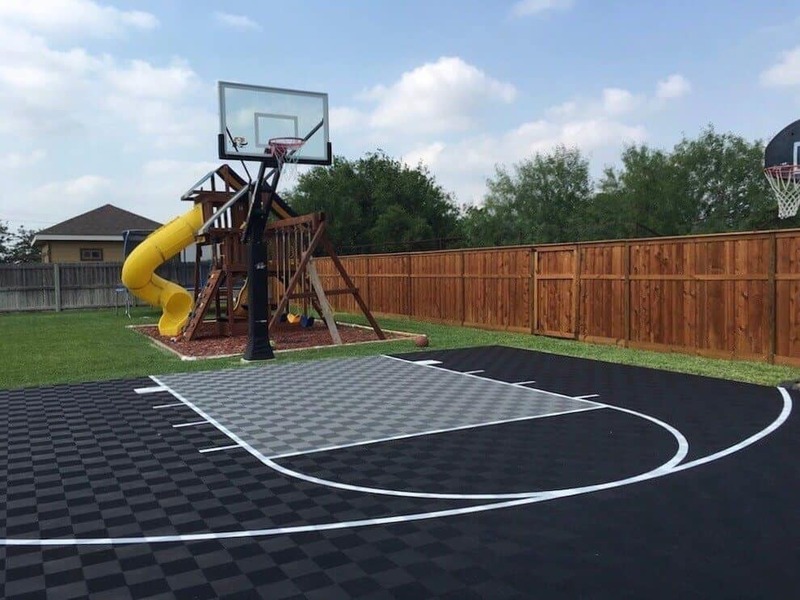 To request a customized outdoor basketball court, please call us toll-free at 1-877-663-8845 to speak with a customer service representative. 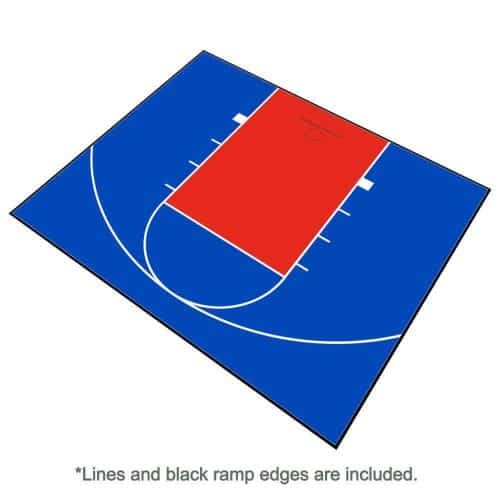 Do you need samples or have questions about your custom court? If so, please contact us by call us at 713-663-6060 or by visiting our Basketball Court Form by clicking the button below. 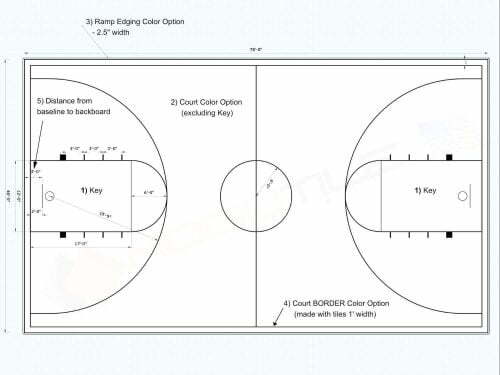 Visit our backyard basketball court floor gallery page to see the different designs and layouts. 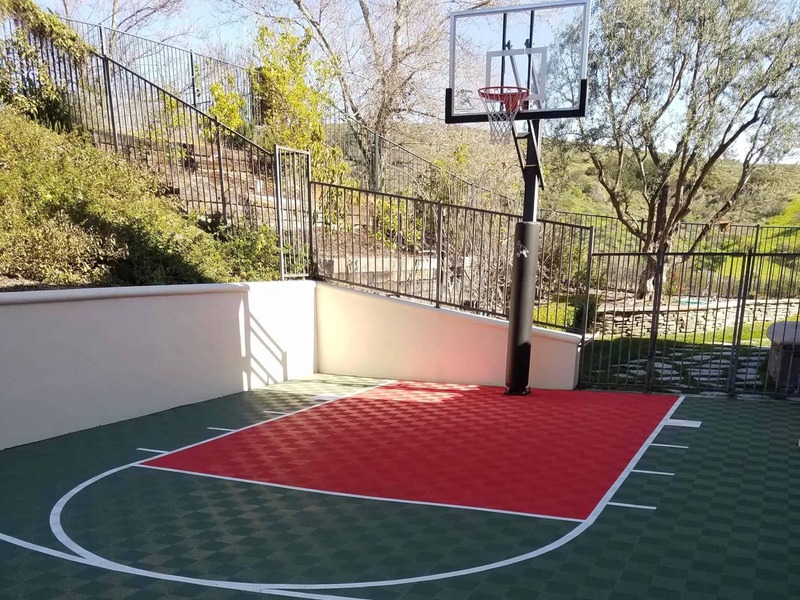 With ModuTile’s interlocking basketball floor tiles, it could not be easier to make your own backyard basketball court look amazing. 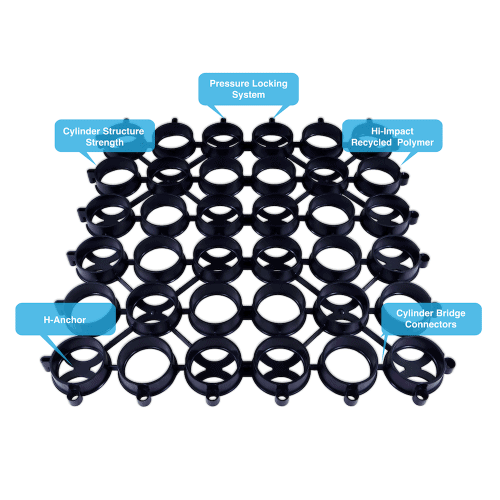 These sport floor tiles interlocking using a loop-to-peg locking system. 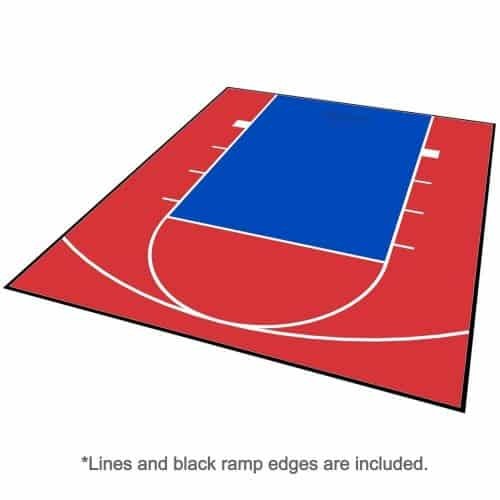 Visit our basketball court installation page for assembly instructions. ModuTile Outdoor Basketball Court Flooring comes in popular colors and dimensions such as full courts and half courts. We have listed 5 kits below that will accommodate the most popular sizes. You do NOT need to buy a kit because we can put together a custom package to perfectly fit your backyard, in any size you need. You pick the colors and the lines and any other designs you want, and we will make it for you. DIY installation is easy, and you will be playing on your own basketball court before you know it. $2.19 – $3.50 sq. ft.
Design possibilities are endless since we can add custom graphics to the interlocking sports tiles. Our customers have requested their high school or college mascots, personal monograms, inspirational quotes, and even their last names. 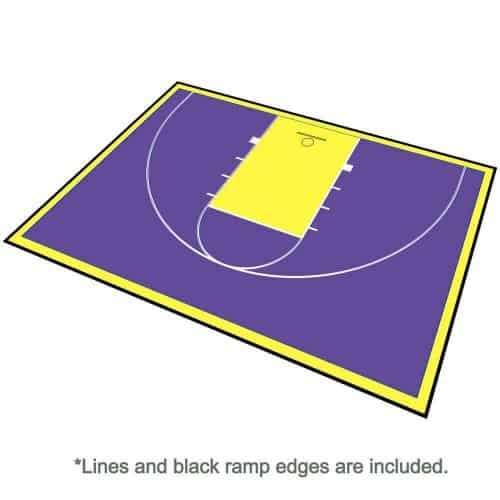 We can add a basketball player silhouette, customized lines, and artwork to the basketball floor. 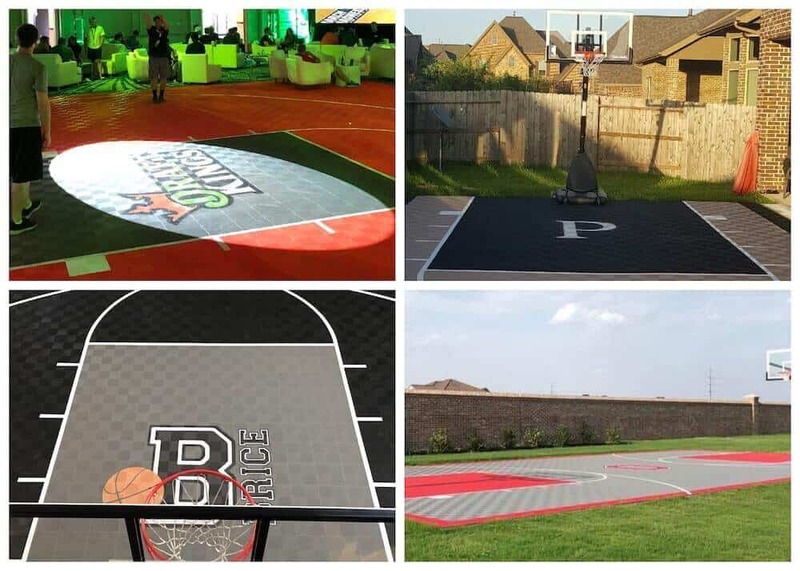 Tough material + Smart design = Top quality sport flooring solution for your backyard basketball court. 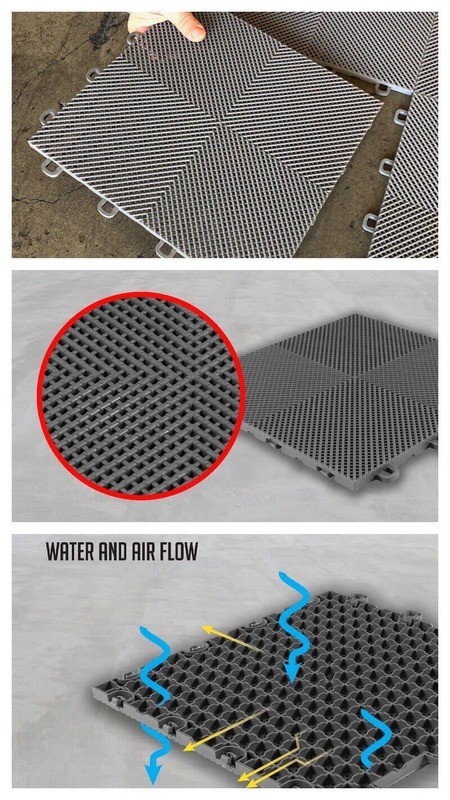 The grid structure creates a floating floor with an air gap between the underlying concrete and the top surface of the tile to allow water flow. Locking System easily connects the tiles together and keeps them together. DIY Installation, no special tools are required. Low maintenance tiles are easy to clean and stain-resistant. Made from High-Impact Polypropylene material strong enough to support vehicles weighing up to 40,000 pounds. Water Drains Through the Mesh Design. Color Combinations to Represent Your Team. ModuTile interlocking basketball court tiles are perforated tiles that are durable enough to support the demands of the most serious athletes and look fantastic in the process. They are perfect for outdoor use because they have UV-protection for direct sun exposure and can withstand wet weather conditions. Basketball court tiles are easy to install, easy to clean and slip-resistant. Alternative Option for Concrete Basketball Court Base. Durable and less expensive court base solution. Permeable pavers help prevent water puddles. An earth-friendly solution as it will lower water runoff and reduce the use of concrete. Cement production is a major contributor to CO2 emission in the environment. Ideal for backyard basketball courtsMade in USA. 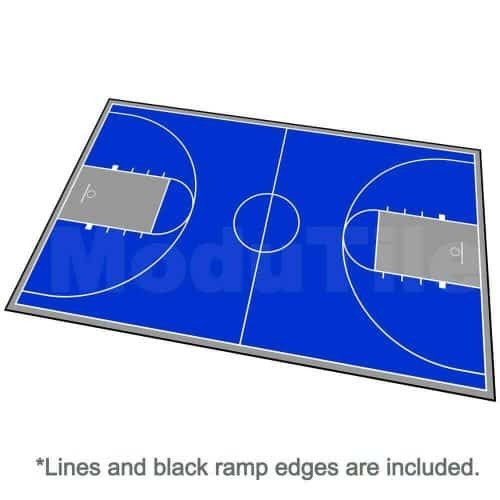 All basketball flooring kits come with border edging that securely interlocks with the court tiles. The edge pieces provide a smooth transition from the underlying floor of your backyard to the basketball court. Custom sized courts may or may not need the border edging. The interlocking tiles can be cut to line up next to a wall; or the edging might not be necessary if the court will border along grass or gravel in your backyard. Edging is optional for custom courts. 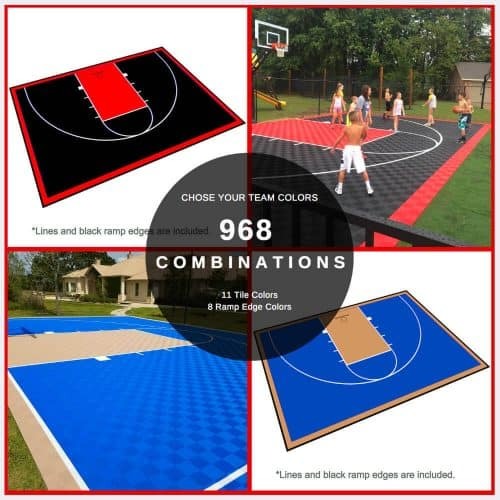 Visit our outdoor basketball court product section to choose from various sizes, colors and designs. ModuTile products have been proudly made in USA since 2011. We love hearing back from our valued clients and sharing their feedback with prospective customers. 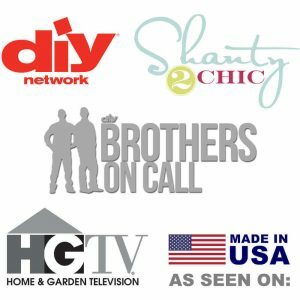 Here are some authentic reviews from happy customers. They continuously amaze us with their creativity and their practical uses of our tiles to solve their flooring issues. Attached is some pics of my court. Overall, I’m very happy of how it turns out.Thank you,P.s. It would be great if you can offer team logos and more color options. Well the tiles arrived earlier than expected around 1030 am. Unfortunately, I didn’t get started right away but I did start around 1130. It was extremely easy but the South Texas heat and the fact that I have zero shade extended the install time. I’ve included a few pictures and a video. We love the way it turned out!The install was easy, especially the way the boxes are so clearly marked.Thanks for all your help! Your outdoor/indoor basketball court flooring questions, answered. Can I use the basketball court tiles over grass or dirt? No, we do not recommend installing basketball court tiles over grass or dirt. Neither grass nor dirt can provide a surface that is flat enough for the sport tiles. Additionally, grass and dirt are prone to erosion which eventually leads to an uneven playing surface.However, installation over properly compacted gravel is possible. You may achieve a stable surface using gravel pavers because they will strengthen the ground to support the tiles. Gravel pavers would reduce erosion and help maintain a flat surface.The basketball court tiles are designed to be used over a solid, hard surface such as compacted gravel, concrete, asphalt, or a wooden subfloor. The tiles are rigid, and they are well suited to cover cracked or imperfect hard flooring, but they will not accommodate significant bumps, bulges or holes, or instability that may be associated with a dirt floor or grass. 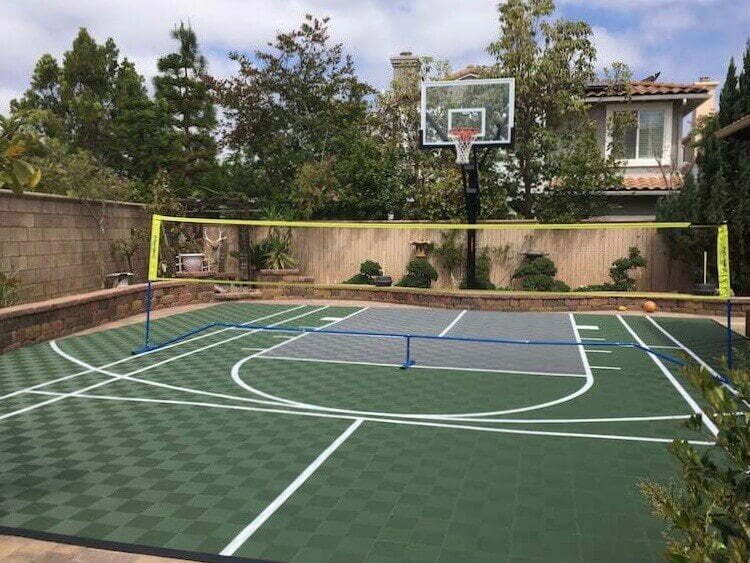 Can I drive over the court if I place it on my driveway? Yes and no, the basketball court tiles can certainly withstand the rollover weight of heavy vehicles driving onto the court. 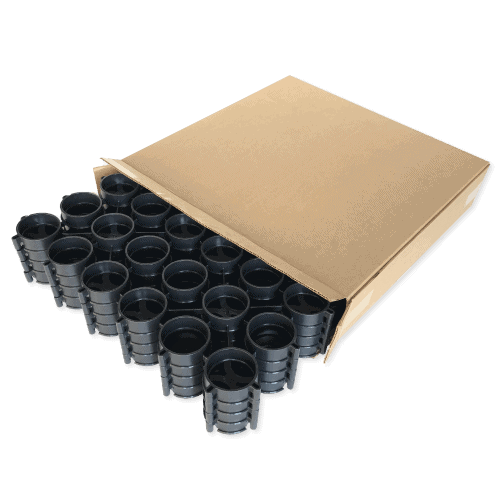 The tiles are made of a very strong and durable high-impact plastic polymer material. However, please be aware that the painted lines may peel with the pressure of the tires. 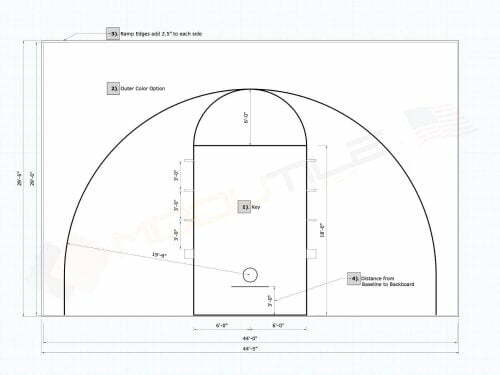 Can you add graphics on the basketball court floor? Yes, we are happy to add graphics to customize your basketball court floor. We can add your alma mater, a mascot, your family name, a basketball player silhouette, or your team name. If you can imagine it, let us know your ideas, so we can make it happen for you. We love creating special and unique courts for our customers to enjoy. 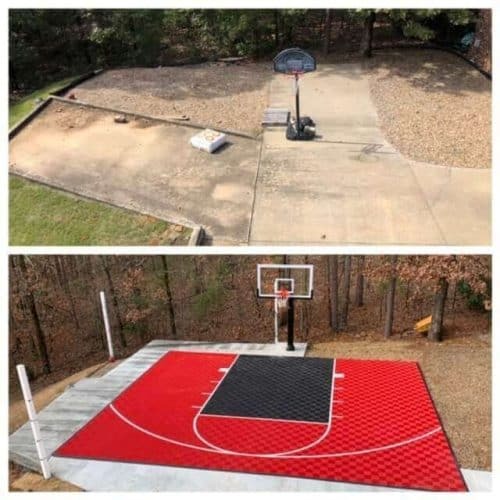 There is no need to have a plain court if you want a backyard basketball court floor that will truly represent you and your love of the game. 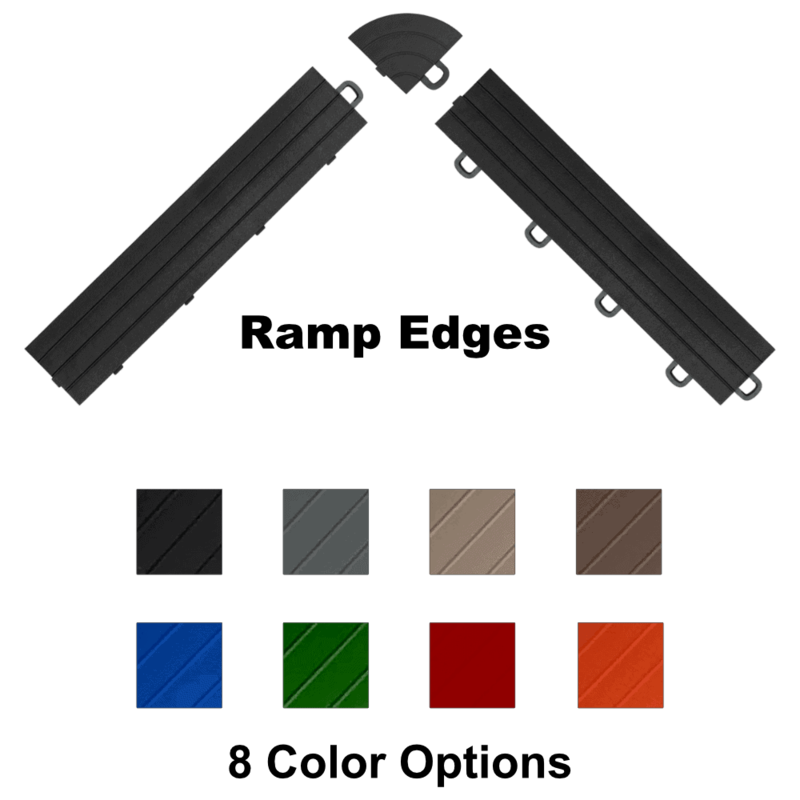 The sports tiles interlock together with a loop-to-peg system. They are packed in sequence and arrive in labeled boxes and are ready to install. 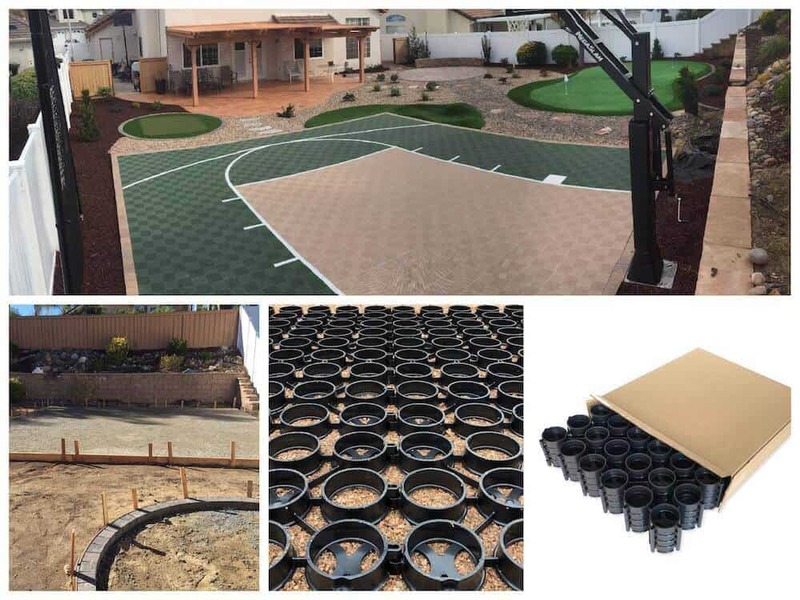 Visit the “How to Install Backyard Basketball Court Tiles” installation guide for a detailed explanation about assembling the flooring after your purchase.